At a new type of festival in the Herrenhausen Gardens in Hannover, the arts are to take center stage. Entitled KunstFestSpiele, the festival will for the first time be presenting an interdisciplinary program which will cross the boundaries conventionally separating artistic genres and follow the dialog between the disciplines. Under the guidance of newly appointed Artistic Director Elisabeth Schweeger, internationally renowned artists will be trying out new forms of artistic activity over a period of 24 days and in the course of 40 events. The green stage of the Baroque gardens will provide the backdrop for encounters between art installations and operatic productions, between concerts of classical and contemporary music, between theatrical dance and music machines. The spirit of the Baroque garden fête and that of the courtly festive culture have thus engendered an eclectic festival which will engage and involve visitors in many diverse ways and provide a challenge to their perceptions. The Swiss artist Roman Signer, whose work has already been shown at the Venice Biennial and Documenta 8 in Kassel, is to create two new pieces of performance art exclusively for Herrenhausen’s KunstFestSpiele event: During his performance on June 18, 2010, a table and chair, a helicopter and a kayak will be radically altered by the artist into a ’sculptural event‘. In the course of this event, the materials will undergo a complex transformation, and the spectator will for a brief while be witness to a ‚temporary sculpture‘ showing the objects in a novel relationship to each other. The film director and performance artist Christoph Schlingensief has created an installation which is to transpose the idea generated by the ‚Festspielhaus Afrika‘ (African Concert Hall) of founding an ‚opera village‘ in Africa from Burkina Faso to Hannover for the duration of the festival. Schlingensief’s opera village is one of the most impressive global art projects: unites different worlds and removes boundaries separating art and real life. As has just been announced, Christoph Schlingensief will be representing Germany at the next Venice Biennial in 2011; his work for Africa will feed into the design of the festival pavilion there. On the spot once occupied by the Baroque Herrenhausen Palace before its destruction by bombing, Thomas Goerge, Matthias Lippert and Gerhard Schebler are constructing the research station Caprificus II. It consists of a fig-shaped laboratory facility, the expeditionary vehicle ‚Psychopompos‘ and the tower-like day-bed of former Hannoverian ruler Ernst August. In the course of the festival, visitors will have the opportunity to gain some insights into the research results. In a fusion of musical theater and installation Heiner Goebbels diverts the attention of the spectator to a side stage in his production ‚Stifters Dinge‘ (Stifter’s Things): there are neither plot nor scene changes to distract the senses in a space in which the theatrical props have become protagonists. Goebbels’s concept was inspired by the stories of Adalbert Stifter and his descriptions of nature. Goebbels incorporates Stifter’s measured linguistic register into a performative installation which for the spectator becomes an encounter with the strange and unknown. In a concert between illusion and reality, Michael Riessler, who roams between musical genres, will with the aid of the illusionist Abdul Alafrez cause an orchestra to levitate during the first-ever performance of ‚Mirages‘. The lighting concept for this performance is provided by Mischa Kuball, the winner of the ‚ars viva‘ award, who is also currently working on a project for RUHR.2010 – Kulturhauptstadt (Cultural Capital of Europe). 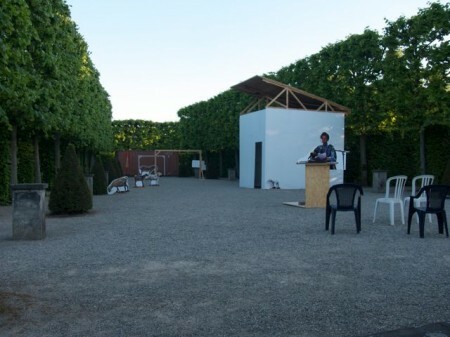 At the close of the KunstFestSpiele the ‚walking artist‘ Hamish Fulton will be inviting visitors to take part in an early morning walk through the gardens of Herrenhausen. In addition to numerous artistic events, the new festival will be offering visitors a program of specially selected musical highlights ranging from Early to Modern music, from opera to musical theater. The State Orchestra of Lower Saxony will be playing, as well the winners of the ARD International Music Competition. The Bach cantatas of the Freiburg Baroque Ensemble will encounter Rebecca Saunder’s installation piece ‚Chroma‘.